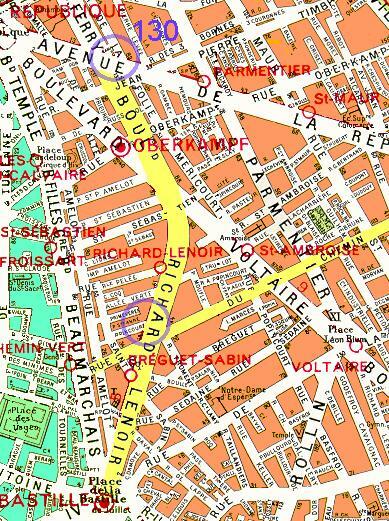 Boulevard Richard-Lenoir and Rue du Chemin-Vert are highlighted. The upper circle is close to the area of No. 130 Boulevard Richard-Lenoir, too far north to match the descriptions in the various stories. The lower circle, approximately Nos. 41-51. At the upper left corner is the Place de la République; at bottom left is the Place de la Bastille. Also at the lower left can be seen the Place des Vosges, Maigret's sometimes address and the location of L'Ombre Chinoise and other stories.